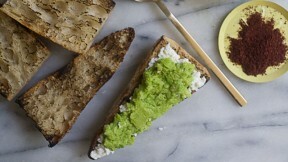 Food blogger Adrianna Adarme's fava bean mash ricotta toasts recipe is a simple and easy appetizer from the Fresh Tastes blog. Fill a small saucepan with about 3 inches of water and place the pan over moderately medium heat. When the water reaches a simmer, add the fava beans and blanch for about a minute. Drain the favas and run them under cold water until they're cool enough to handle. Peel the rough outer shell of the favas, revealing a bright green bean. Repeat until you've worked your way through all of the fava beans. To the jar of a food processor or blender, add the shucked favas, juice from 1 lemon, a splash of water, a few pinches of salt, and mint leaves. Pulse until the mixture resembles a rough puree. With the machine running, drizzle in the oil until the mash is a bit smoother in texture. Salt and pepper to taste. Rub the garlic clove on the surface of each slice of bread. Toast the bread under the broiler. If the edges of the bread burn a little, welcome them--they're great added flavor. To assemble the crostinis, divide the ricotta amongst the slices of toast, top with fava bean mash, a dash of salt and a sprinkling of sumac.